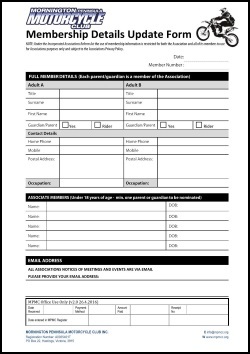 NOTE: If any of your membership details have changed, please download and fill in the Members Details Update form. Completed Membership Update Form if your details have changed. A passport size photo of any riders. (each rider is issued with a photo ID) NOTE: If the photos on your old cards are OK we can reuse them, just give us your old cards when you renew. PLEASE NOTE: memberships that have been expired for more than one year may require a new member number and will have to go through the new membership procedure.